Setting up a new office is a big task. But a bigger battle is to make your “first employee” shine. It’s this employee that your existing and potential customers will see at first. We believe business signs to be this all important “first employee” that your customers will see before anything else and form their first as well as subsequent opinions based on it. Hence, this makes it important to create outstanding exterior and interior signage that reflects your brand the way it should, tell people who you are and what you do. Your retail signage should elicit a positive feeling and encourage people to do business with you. 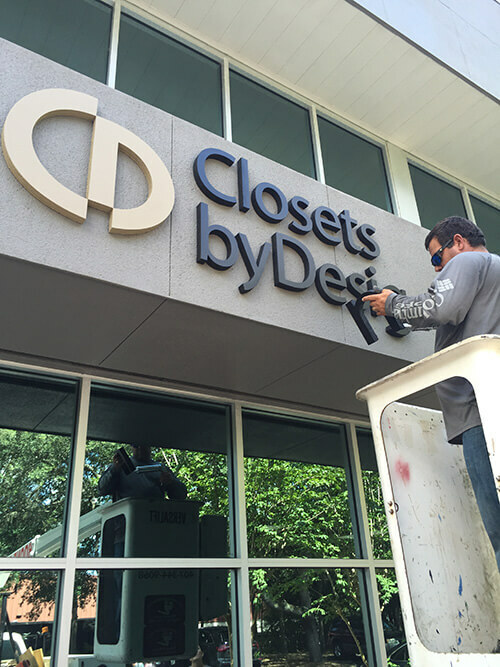 This makes it crucial to get outdoor signs for business designed the right way, especially for businesses setting up an office at a new location or opening a new showroom. 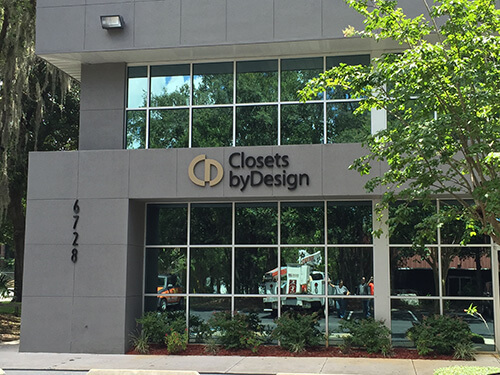 When Closets by Design decided to walk this path, they hired Citrus Sign Studio to help them with their business signs and installation. 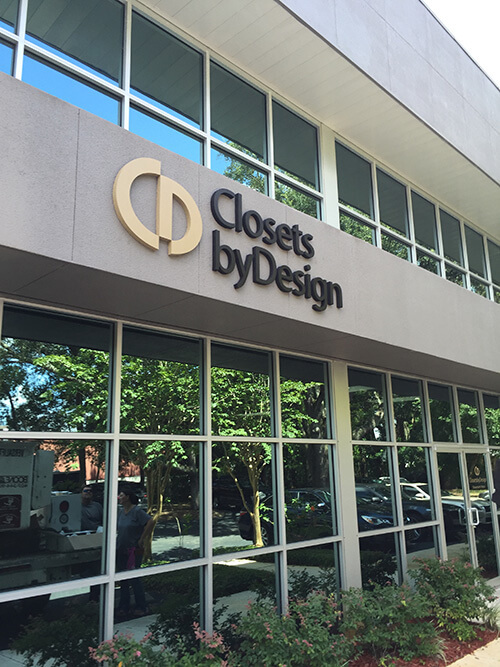 Closets by Design is into designing, creating and installing custom garage cabinets, closets, home offices, pantries, wardrobe mirror doors, laundries and much more. When they decided to open a new showroom to help simplify the lives of their prospective clients, they hired Citrus Sign Studio for their interior and exterior signage that would give their new showroom the finishing touches, showcase their branding and welcome new clients into doing business with them. Outdoor signs for business need to stand out, be eye-catching and encourage customer traffic as much as possible. 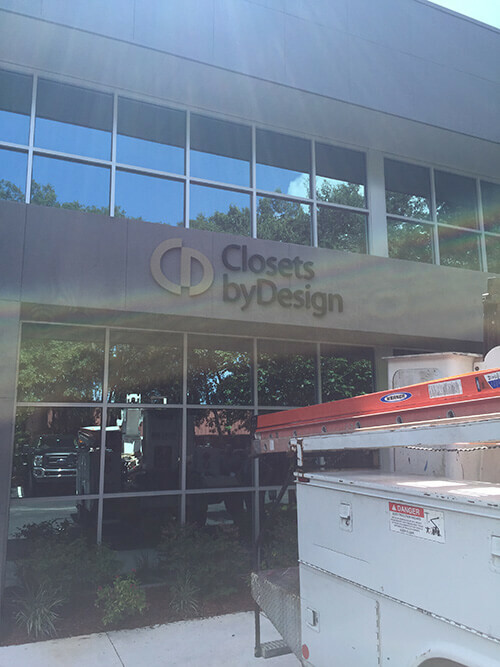 That was exactly our aim when we decided on the size and placement of Closets by Design’s retail signage. Since the company already had its logo, our job was to finalize how the logo would appear beside the business name and its precise location on the exterior walls of their new showroom location. We created their logo featuring letters C and D in a soft golden color placed side by side and connected to each other. The letters of the business name in a dark chocolate color were created too meet the brand standards for Closet by Design. Unlike the raised Letters used in the logo and company name on the outdoor business signs, the interior signage letters needed to be somewhat flat. We created them in a bit different manner to make them suitable for the showroom interiors. The exterior signage was placed on the mid-section that separated the glass walls of the ground floor and first floor. The strategic location made it easy to spot and read from a distance. 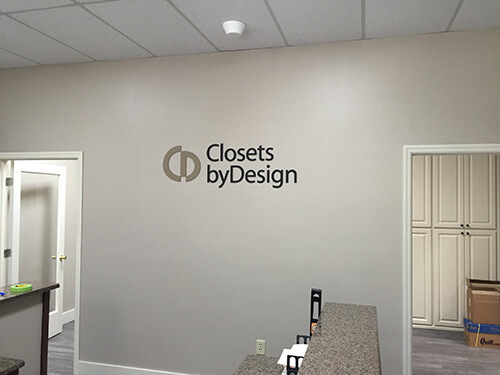 Our installers took the letters of Closets by Design’s logo and business name and mounted them on the wall securely. 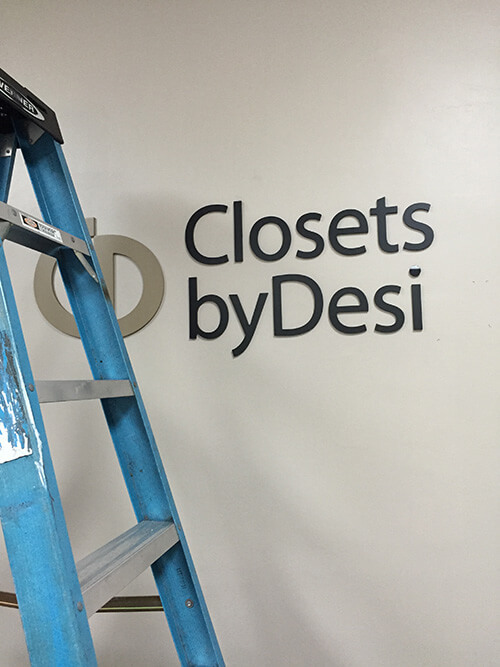 For interior installation of retail store signs, our installers used a folding ladder to put up the logo and company name on the wall that was prominently visible once anyone steps into the new showroom of Closets by Design.